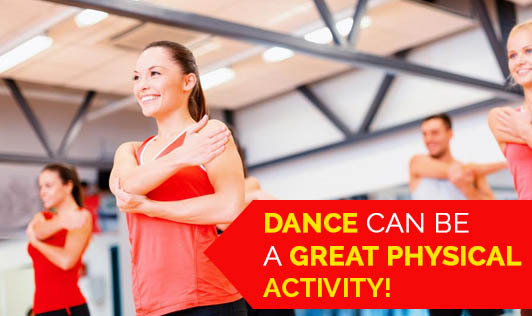 Dance Can Be A Great Physical Activity! Dance, the word itself will make us want to fly, sing, and dream. Dance is a great activity by itself. It is said that dance will rejuvenate our senses and make us think better, relieve stress. Dance is said to sharpen our mind and improve overall health. Dance increases your strength: Dance will strengthen your bones and muscles thereby increasing the strength. Dance burns calories: Dance is a beautiful form of exercise to lose weight. It will help you in maintaining your weight too. Dance gives you shape: Dance in any form will make you lose your extra fat and tone your body to the desired shape. This will make you look very elegant and beautiful. Dance protects you in your old age: Dance will keep you fit and fine at a young age. It will help you maintain your body in right condition. In the old age it will help you maintain strong bones and also you will be avoiding all metabolic disorders and hereditary diseases to some extent. Dance and Women’s Health: Many studies say that any good physical activity like dance will bring control on the spasm during the monthly periods. It will reduce the pain and flow will also be normal. Dance improves social life: Dance by itself is an activity to be performed in a group and its fun. We get to interact, learn, and teach which will improve our social life. Dance enhances beauty: Dance will help boost your skin health. Dance will make you sweat and so the dirt is removed from the skin. It will make your skin and hair look beautiful and rejuvenated. Dance is an art, a physical activity that can change you and your health. Be active and enjoy your life.